flipbookME gives you GIFs you can physically carry around. 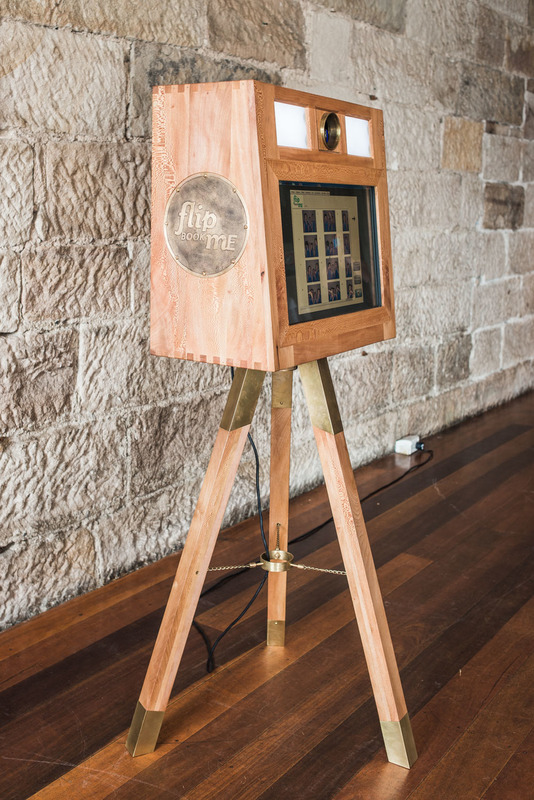 It's a photobooth, but not as you know it. We have successfully completed over 2000 photobooth hires in our time, and we aren't sick of photobooths but that doesn't mean we weren't looking something else to excite us even more. That thing is our flipbookME mobile studio. flipbookME is more than just another photobooth. It is a video booth, and not the boring kind that your drunk cousin leaves a swearing message on. With flipbookME your guests phycially get to take their own silent movie home with them. Your guests are invited into the well-lit flipbookME mobile studio and are encouraged to take an 8 second video. Movement is always the key here. Jumping, dancing, acting out a love scene, a fight scene or just being plain silly are all excellent ideas for an 8 second bit. The video, well, lets call it a 'film' is replayed on the screen for the stars to review. If they deem it a masterpiece and approve then one of our flipbookME attendants sets to work. It is a dazzling display of printing, cutting, binding and you will end up with a 60 page flip book of your masterpiece film in your hand. Flip it fast, flip it slow or flick through and check out the ridiculous faces people always tend to pull in creating their film. That has to take forever, right? Actually, no it doesn't. Our highly talented and ultra fast moving flip book makers can create up to 50 flip books at full pace every hour. That is almost as quick as the quickest photo booths can product photo strips and these are 60 page books! flipbookME has been a hit at every function we have ever been to. Everyone crowds around to create their own film, take home a flip book and watch others go through the process. Here is a video that might help explain things a little bit better. We charge $500 to set up the studio and then it is $300 per hour for unlimited video and flip book production. Included in the price is customised flip book covers, two attendants, an XL prop box and a white back drop (if required). You also receive a digital copy of all the videos after the event and re-prints are available for a small fee. Where can I have flipbookME? We can go anywhere you can find 3m x 3m of space. We have been to weddings, corporate events, shopping centres, parks, stadiums and product launches. We can even fit in a little smaller, or different shaped spaces if need be. Just let us know what you've got for us and we will let you know if we can do it. We understand that flipbookME is hard to communicate fully with just words on a web page. We will be working on some more photos of the set up and a better video of the process in the near future but until then please feel free to give our flip book guru Rupert a call on 0412 024 012 and let him chew your ear off about how it all works and decide if it is for you. If it is 2am on a Wednesday and you are reading it, maybe it is a better idea to use the enquiry form below instead. Offering the best range of photobooths in Sydney, unparalleled service and unbeatable value, photoboothME is your expert for photobooth hire Sydney services. photoboothME offers wedding photobooth hire and corporate functions photobooth hire, as well as photobooth hire for parties, formals, marketing events and more, so speak to us today about how we can make your special occasion better than ever!